What is the liver? Describes the function of liver in digestion. The liver, the largest organ in the mammalian body, that lies just under the diaphragm. In the liver, millions of cells that is called hepatocytes take up nutrients that absorbed from the intestines and release them into the bloodstream. 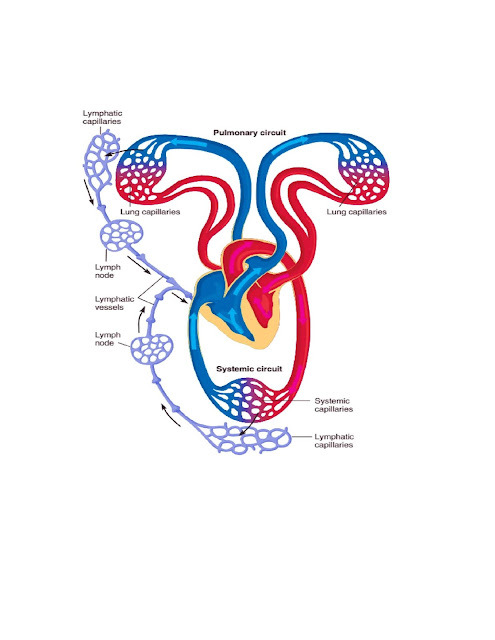 Hepatocytes perform the function the manufacture of blood proteins prothrombin and albumin. 1. Removal of amino acids from organic compounds. 2. Urea formation from proteins and conversion of excess amino acids into urea to decrease body levels of ammonia. 3. Manufacture of most of the plasma proteins, formation of fetal erythrocytes, destruction of worn-out erythrocytes, and synthesis of the blood-clotting agents prothrombin and fibrinogen from amino acids. 4. Synthesis of nonessential amino acids. 5. Conversion of galactose and fructose to glucose. 6. Oxidation of fatty acids. 7. Formation of lipoproteins, cholesterol, and phospholipids. 8. Conversion of carbohydrates and proteins into fat. 9. Modification of waste products, toxic drugs, and poisons. participation in the activation of vitamin D.
11. Maintenance of a stable body temperature by raising the temperature of the blood passing through it. Its many metabolic activities make the liver the major heat producer in a mammal’s body. 12. Manufacture of bile salts, which are used in the small intestine for the emulsification and absorption of simple fats, cholesterol, phospholipids, and lipoproteins. 13. Main storage center. The liver stores glucose in the form of glycogen, and with the help of insulin and enzymes, converts glycogen back into glucose as the body needs it. The liver also stores fat-soluble vitamins (A, D, E, and K), and minerals, such as iron, from the diet. The liver can also store fats and amino acids, and convert them into usable glucose as required. The pancreas is an organ that lies ventral to the stomach and consist of both endocrine and exocrine functions. The function exocrine cells in the pancreas secrete digestive enzymes into the pancreatic duct, which unite with the hepatic duct from the liver to form a common bile duct that enters the duodenum. Pancreatic enzymes complete the digestion of carbohydrates and proteins and initiate the digestion of lipids. Trypsin, carboxypeptidase, and chymotrypsin digest proteins into small peptides and individual amino acids. Pancreatic lipases split triglycerides into smaller, absorbable glycerol and free fatty acids. Pancreatic amylase converts polysaccharides into disaccharides and monosaccharides. The large intestine lack circular folds, villi, or microvilli and has the much smaller surface area. 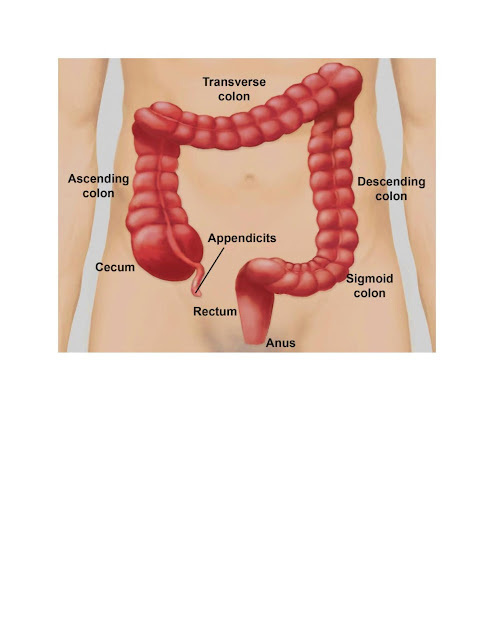 The small intestine joins the large intestine near a blind-ended sac, that is called cecum. The human cecum and its extension, the appendix, are storage sites and possibly represent evolutionary remains of a larger, functional cecum, such as is found in herbivores. reabsorption of water and minerals, and the formation and storage of feces. As peristaltic waves move food residue along, minerals diffuse or are actively transported from the residue across the epithelial surface of the large intestine into the bloodstream. Water follows osmotically and returns to the lymphatic system and bloodstream. When water reabsorption is insufficient, diarrhea results. remains feces is a mixture of bacteria, fungi, undigested plant fiber, sloughed-off intestinal cells, and other waste products. (2) Secretes substances such as enzymes, mucus, and hydrochloric acid [HCl] that digest the protein. 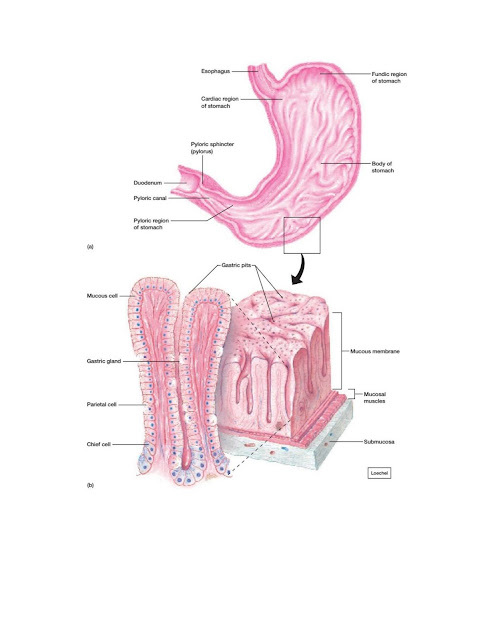 intestine through the pyloric sphincter (figure a). The stomach is made up of an inner mucous membrane containing thousands of gastric glands (figure b). Parietal cells that secrete a solution that contain HCl. Chief cells that secrete pepsinogen, the make from the enzyme pepsin. Both of the cells are in the pits of the gastric glands. The surface of the mucous membrane at the openings of the glands contains numerous mucous cells that secrete mucus that cover the surface of the stomach and protects it from the HCl and digestive enzymes. The surfaces of the upper gastrointestinal tract the esophagus and mouth have a much thinner mucous-cell layethan the stomach, which is why vomiting can cause a burning sensation in the esophagus or mouth. Endocrine cells in one part of the stomach mucosa release the hormone gastrin, which travels to target cells in the gastric glands, further stimulating them. When the bolus of food enters the stomach, it distends the walls of the stomach. This distention, as well as the act of eating, causes the gastric pits to secrete HCl and pepsinogen. The H ions cause pepsinogen to be converted into the active enzyme pepsin. As pepsin, mucus, and HCl mix with and begin to break down proteins, smooth mucosal muscles contract and vigorously churn and mix the food bolus. About three to four hours after a meal, the stomach contents have been sufficiently mixed and are a semiliquid mass called chyme .The pyloric sphincter regulates the release of the chyme into the small intestine. When the stomach is empty, peristaltic waves cease, after about 10 hours of fasting, new waves comes from the upper region of the stomach. These waves can cause hunger pangs as sensory nerve fibers carry impulses to the brain. Oral cavity is protected by the pair of lips. The lips consist of vascularized, skeletal muscle tissue which are present in sensory nerve endings. Lips help retain food in the mouth as it is being chewed and play a role in phonation. 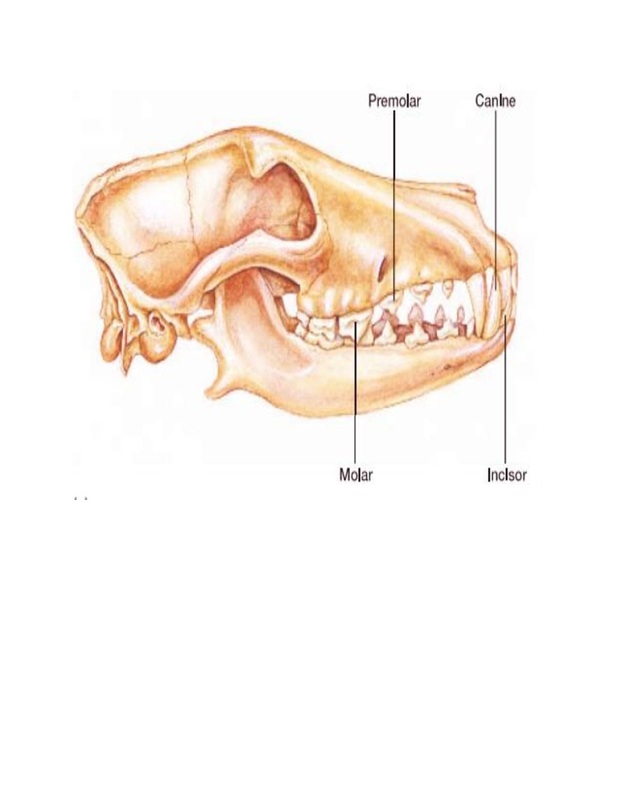 The oral cavity contains the tongue and teeth ( see figure). Mammals can mechanically process a wide range of foods because their teeth are covered with enamel (the hardest material in the body) and because their jaws and teeth exert a strong force. The oral cavity is consist of saliva, a watery fluid that secrete by least three pairs of salivary glands. Saliva help to moistens food, binds it with mucins (glycoproteins), and forms the ingested food into a moist mass called a bolus. Saliva also contains bicarbonate ions (HCO3), which buffer chemicals in the mouth, and thiocyanate ions (SCN) and the enzyme lysozyme, which kill microorganisms. It also contributes an enzyme (amylase) necessary for the initiation of carbohydrate digestion. Describes the process of digestion and absorbing in mammals? 1. Ingestion; The process in which mammals are eating. 2. Peristalsis; The involuntary muscular contractions that move ingested nutrients towards the digestive tract. 3. Segmentation; In these process mixing the contents in the digestive tract. 4. Secretion; The release of hormones, enzymes, and specific ions and chemicals that take part in digestion. molecules into small particles or molecules. 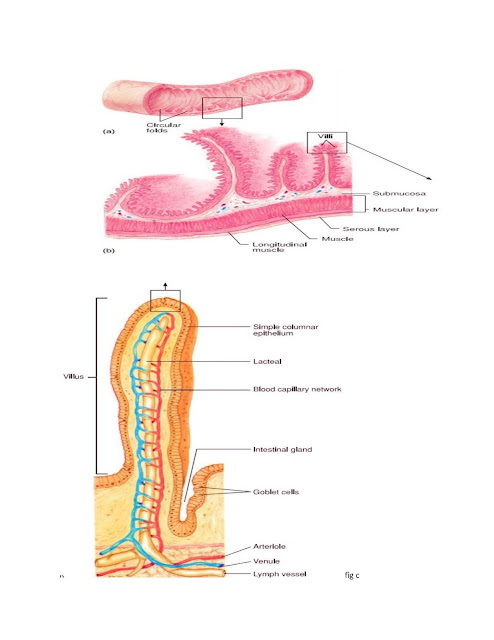 the small intestine into the bloodstream and lymphatic system for the final passage to body cells. and unabsorbed material as waste. Respiratory pigments are organic compounds that consist of metallic copper or iron that binds oxygen. These pigments may be in form of solution within the blood or body fluids, or they may be present in specific blood cells. These pigments respond to a high oxygen concentration by combining with oxygen and to low oxygen concentrations by releasing oxygen. The four most common respiratory pigments are hemoglobin, hemocyanin, hemerythrin, and chlorocruorin. Hemoglobin is a reddish pigment that contains iron that bind to oxygen. It is the most common respiratory pigment in animals and found in all vertebrates. Hemoglobin may be carried within red blood cells or simply dissolved in the blood or coelomic fluid. always occurs dissolved in hemolymph. Hemocyanin is the most commonly occurring respiratory pigment in molluscs and certain crustaceans. Hemocyanin release oxygen easily and to provide a ready source of oxygen to the tissues as long as concentrations of oxygen in the environment are relatively high. Hemerythrin contains iron and is pink when oxygenated. It is nucleated cells, rather than free in body fluids or hemolymph. Sipunculans, priapulids, a few brachiopods, and some polychaetes have hemerythrin. Chlorocruorin also contains iron but is green when associated with low oxygen concentrations and bright red when associated with high oxygen concentrations. Chlorocruorin occurs in several families of polychaete worms.